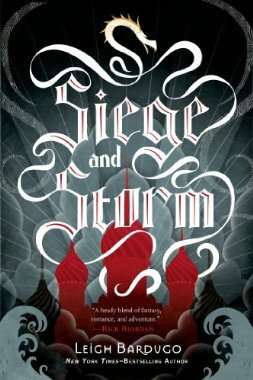 Leigh Bardugo was born in Jerusalem, gew up in Los Angeles, and graduated from Yale University. These days, she hides out in Hollywood, where she indulges her fondness for glamour, ghouls, and costuming in her other life as a makeup artist in Hollywood. She can occasionally be heard singing with her band, Captain Automatic. Her first novel, Shadow and Bone, was a New York Times best seller. Alina and Mal have escaped with their lives once again and have disguised themselves enough to earn money in order to get as far away from The Darkling, even if that means using her power to get across the Unsea again. The story starts off quietly enough with a bit of recovery for the pair as they grow closer and with a bit more romance, but a magical mystery tour is soon upon them. A privateer - not a pirate- captain named Sturmhond, (YES! I got somewhat of a dog in this story, even if it is in name only), has a plan and it involved the newly revealed Saint Alina. As Alina finds a book of saints in her pocket that reveals bits and pieces of a map for her to follow. This is turn leads to an epic quest of discovery for both her and Mal. As Alina discovers that she has more strength and power than she thought ever possible, she finds that she must make some heart-rendering choices between her and Mal, her country and The Darkling. Although we don't hear much from him and he appears mostly in Alina's dreams, he is still a strong presence in her life. Poor Mal, it seems all he does is suffer with her decisions and you begin to wonder if the relationship will ever survive. After several plot twists, some exciting battles, both physical and mental, Alina survives her trial only to find something more life changing to come. This second installment is as good, if not better, than the first. Alina grows and begins to fulfill everything she dreams of for her life. I have to say that there appears to be a bit of a love triangle when Sturmhond - what a fun and delightful captain - challenges her to become everything she can be. I have high hopes for the final installment. Parents: this is best suited for teens since there is some violence, some sexual situations and language.